In a new paper, Parametric Estimations of the World Distribution of Income, Maxim Pinkovskiy and Xavier Sala-i-Martin revisit previous work by Sala-i-Martin, and estimate that globally income has substantially increased, reducing the number of people living in extreme poverty, and become more equally distributed (among individuals globally) over the past decades. 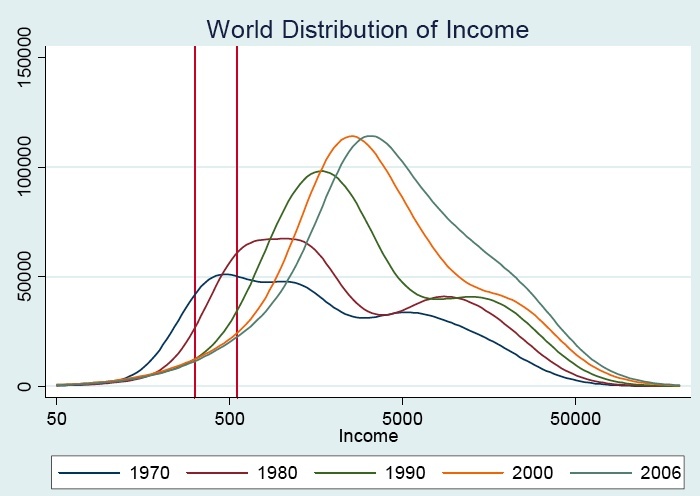 World distribution of income 1970-2006 (Pinkovskiy & Sala-i-Martin 2009). Red lines show 2006 and 1980 $1 day/income level. In 1970, the WDI was trimodal (Fig. 19). There was a mode between the two $1/day lines, corresponding to the mode of the East Asian distribution (which, in turn, corresponds to the mode of the Chinese distribution which, in turn, corresponds to the mode of the Chinese rural distribution). The second mode is at about $1,000 and corresponds to the mode of South Asia which, in turn is slightly to the right of the mode of India. 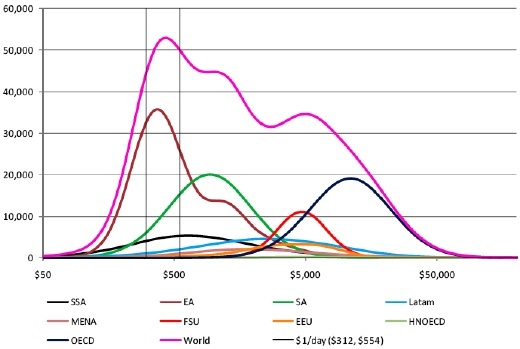 Finally, there is a third mode at around $5,000, which is somewhere between the mode of the USSR and that of the OECD. 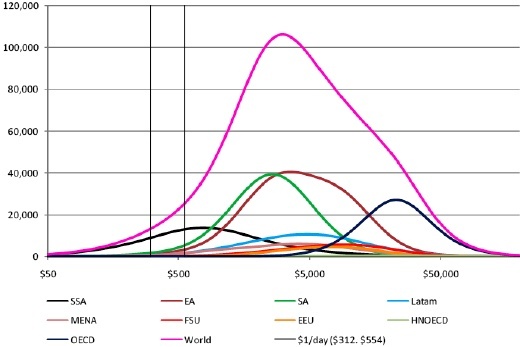 Note that a substantial fraction of the distribution lies to the left of the poverty lines, and that substantial fractions of the East Asia, South Asian, and African distributions lie to the left of the poverty lines. In 1970, $1/day poverty was large. By 2006 things have changed dramatically (Fig. 20). First, note that the three modes disappeared. Instead, we have one mega-mode at an annual income of around $3,300, which roughly corresponds to the mode of East Asia and South Asia. To the right of the mode there is quite a substantial “shoulder” marked by the roughly 1 billion rich citizens of the OECD. At the other extreme, there is a thick tail at the bottom of the distribution marked by Sub-Saharan Africa. The fraction of the overall distribution to the left of the poverty lines has been reduced dramatically relative to 1970. Interestingly, most of the distribution to the left of the poverty line in 2006 is from Africa.